Our Events | drumSTRONG : drumming to BEAT cancer. April 13, 2019 at Queens University. The Music Therapy Club sponsors a DRUMSTRONG Fund-raising Drum Circle from 7:00-10:00 pm. Interactive Drum Circle at the Fire Pit on the campus Quad. Park on Radcliffe or in front of Queens on Selwyn, 1900 Selwyn Ave, Charlotte, North Carolina 28207 :: Free to play! Drumming with The NEST every Friday. The Nest provides education and a warm sense of family to under-privileged youth, many from compromised and distant environments. The DRUMSTRONG Float in the 2018 Thanksgiving Day Parade in Charlotte. Look what we got to do on Thanksgiving morning! DRUMSTRONG drummers and lovers shared our pulse with 150k peeps on the streets of Charlotte and raised the spirit in honor of, in memory of and in support of all those dealing with the C-monster beast. True heartfelt love and appreciation for those who braved the crisp, clear morning and celebrated the challenges and fortified Hope. We really did ROCK (while rollin)! May 8, 2013 :: Levine Children's Hospital :: 2:00 pm :: DRUMSTRONG and Queens U Music Therapy students will bring drums to play with the children, families and staff. 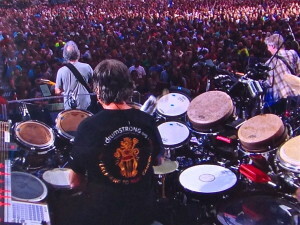 DRUMSTRONG will facilitate a special interactive Drum Circle to open Mickey Hart's Neighborhood Theatre gig. Beautiful Belly Dancers, Didge and Drums! come out & Play! April 30, 2013 :: Levine Children's Hospital :: 2:00 pm :: DRUMSTRONG and Queens U Music Therapy students will bring drums to play with the children, families and staff. May 15, 16 & 17 DRUMSTRONG 2012 MAIN EVENT - 30 HOUR NON-STOP RHYTHM TO BEAT cancer! May DRUMSTRONG 2007 MAIN EVENT - FIRST ANNUAL! Sun, 05/22/2011 - 3:00pm - 5:00pm :: Chicago, Ill.